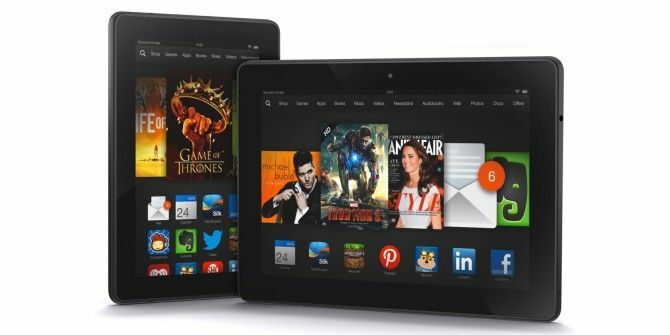 Amazon has launched an update for its Fire OS, which powers the Kindle Fire and Kindle Fire HDX tablets. And as noted in the Kindle Fire HDX review Amazon Kindle Fire HDX Review and Giveaway Amazon Kindle Fire HDX Review and Giveaway Is the Kindle Fire HDX worth owning if you haven't owned a Kindle before? To find out, we purchased a 16 GB Kindle Fire HDX 7" (Wi-Fi) without special offers for $244, and we're giving... Read More , it’s the software experience that makes it different from any other Android tablet. Fire OS 3.1 has deep integration with Goodreads, the community of book lovers Goodreads Reviewed: A Must-Use Site For Any Book Lover Goodreads Reviewed: A Must-Use Site For Any Book Lover If you enjoy reading, and like to use the Internet for finding great new reads, you may well have heard of Goodreads before: This is a superb website hosting a vibrant community of book lovers,... Read More for recommendations and reviews. There’s no need to leave a book and open the Goodreads app, as users can capture and share quotes, see what friends are reading, add books to the want-to-read shelf, rate and review a book, and import all of your Amazon books into your Goodreads account. Along with that, Fire OS 3.1 introduces Amazon’s attempt at taking on Google Chromecast Google Chromecast Review and Giveaway Google Chromecast Review and Giveaway We're giving away a Google Chromecast, so read through our review, then join the competition to win! Read More , the device that lets you stream your smart device’s contents to a nearby TV. Amazon’s Second Screen has a similar function with which you can “fling TV shows and movies from your tablet to your big-screen TV”, using your Kindle Fire HDX for playback controls, a custom X-Ray display, read emails or browse the web, and more. Currently, Second Screen will be available on the PlayStation 3 and Samsung Smart TVs; it will also be coming to the PlayStation 4 soon. The new Cloud Collections feature lets users easily organize newspapers, magazines and books into groups that are synced across all Kindle devices. If you’re running short on space, 1-Tap archive frees up space by letting you storing unused items in the cloud. The update also brings speech-to-text functionality and wireless printing. Fire OS 3.1 is available as an over-the-air (OTA) update on the new generation of Kindle tablets, including the $139 Kindle Fire HD, the 7” Kindle Fire HDX, and the 8.9” Kindle Fire HDX. You can also manually download it from www.amazon.com/kindlesoftwareupdates. Explore more about: Amazon Kindle Fire, Book Reviews, Ebooks.